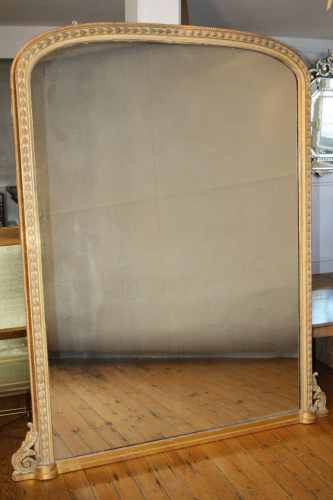 An elegant carved wood English Victorian overmantle archtop mirror with original sparkly mercury glass mirror plate. Originally covered in white gloss paint - the mirror frame has been stripped to reveal patches of gold leaf as well as the soft pale yellow coloured bole or gesso over the carved wood. The outer edge sides next to the bobble beading retain most of the gold leaf, whereas the inner carved wood tulip designs are more the soft yellow bole/gesso and pale light brown from the wood. The bottom corners are finished with classic acanthus leaves. Original panelled back. A suberb design and scale. c1880.